In fact, the forecast – filled with wind and snow and fast-moving clouds – was so poor that I fully expected our Northern Lights tour to be canceled altogether. After all, you need clear conditions to see the dancing lights, and the forecast was anything but clear. But when Marie and I turned up at the meeting point near Tromsø's waterfront, the tour buses were still there, ready to carry eager aurora-viewers off into the inclement night. It took an hour to get out to Tromsø Friluftsenter's base camp. We watched a video about the history and science behind the Northern Lights, and I surreptitiously re-checked the weather forecast. When we got to the base, the wind was whipping and snow was blowing sideways into our faces as we made our way into the large lavvo tent. Our guide, Trine, assured us not to worry. But I'm pretty sure none of us was expecting a Lights show that night. But that aurora… she's a tricky lady. A couple hours later, we were all outside the lavvo jumping up and down and yelling “OH MY GOD” over and over as the Northern Lights danced across the sky above our heads in a spectacular light show of green and purple. 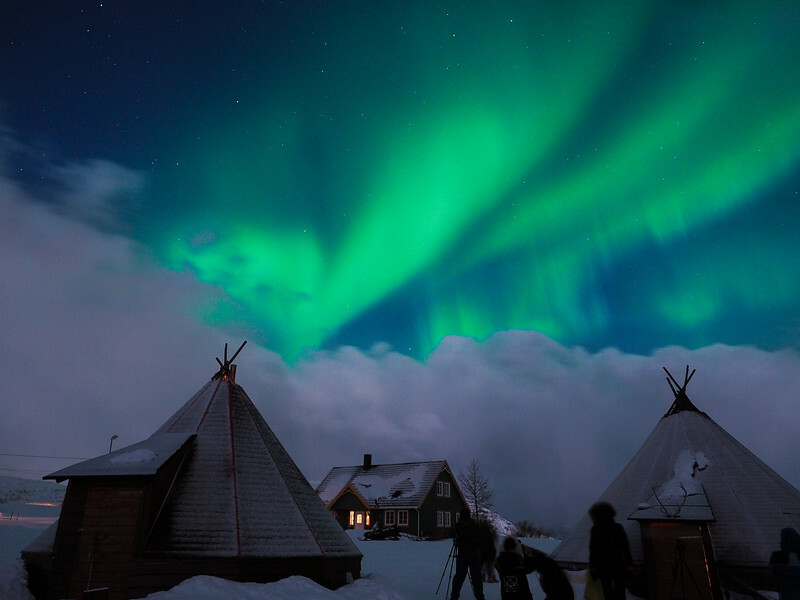 It just goes to show that nothing is guaranteed when it comes to the aurora borealis – and that every Northern Lights-chasing experience is almost guaranteed to be different. 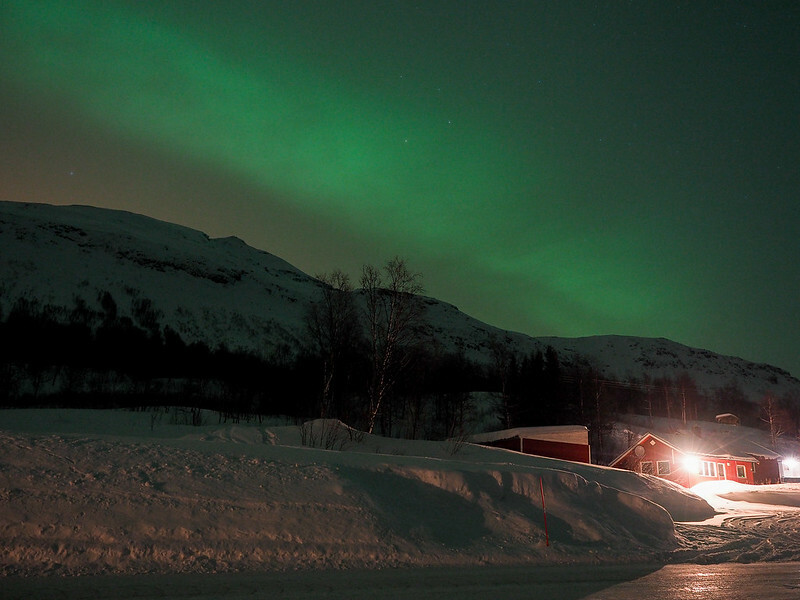 My first brush with the Northern Lights in Northern Norway came, perhaps aptly, in the city of Alta. 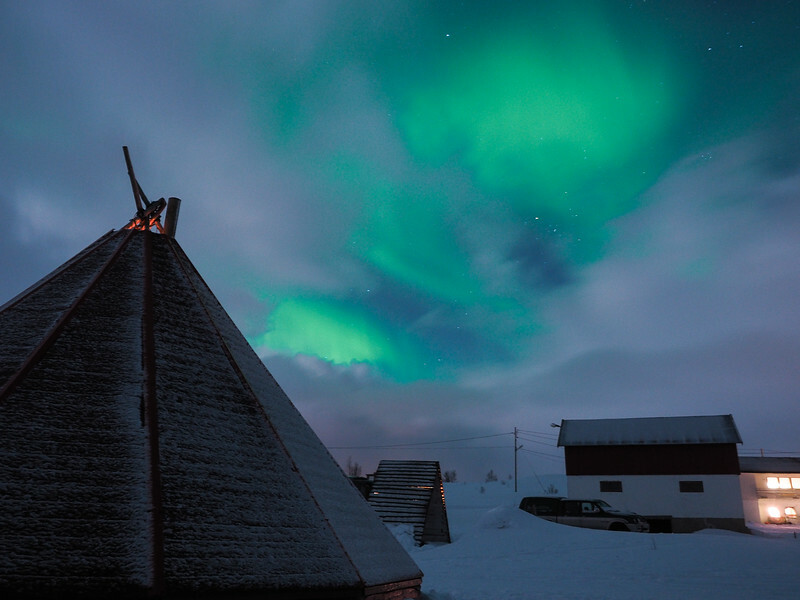 I say aptly because Alta is known as the “City of the Northern Lights” owing to the fact that the world's first observatory dedicated to studying the Northern Lights was built here in the 1800s. There's even a church in Alta with a facade that resembles the falling “curtains” of the aurora called the Cathedral of the Northern Lights. Located roughly 300 miles north of the Arctic circle, Alta is a small city with some big nature. 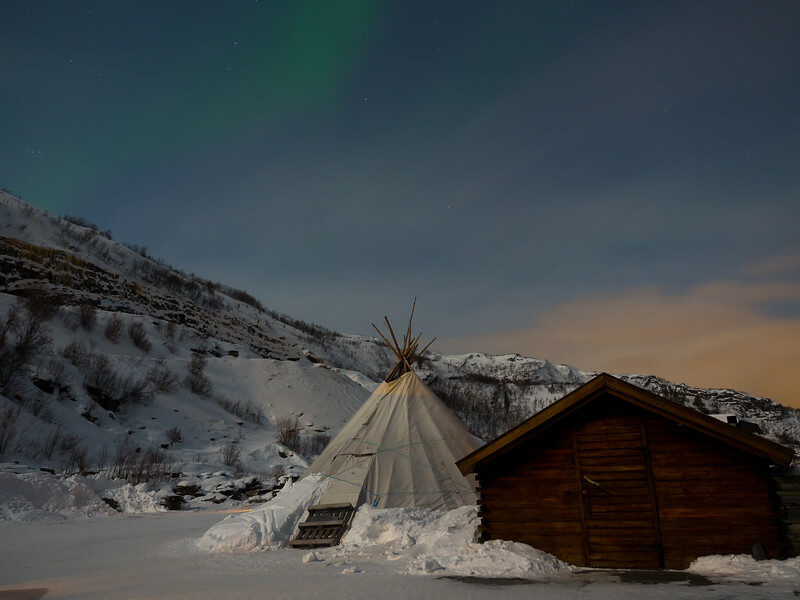 The Northern Lights blaze here on far more nights than they're quiet, and even though Alta is on a fjord, it often has fairly dry and mild weather – perfect for spotting the aurora. Except, of course, when Marie and I were there. My track record with the Northern Lights is a bit rocky. I saw them twice in northern Manitoba in 2013, but failed to get even a glimpse on two separate winter trips to Iceland. I knew that we were in the right place to spot the Lights in Northern Norway, but the weather and aurora forecast had to cooperate, too. Our tour in Alta was operated by Pæskatun, which offers both Northern Lights and special slate tours (Alta is also known for its quality slate production, and Pæskatun owner Trond Håvard Strifeldt has been mining slate since he was 16). 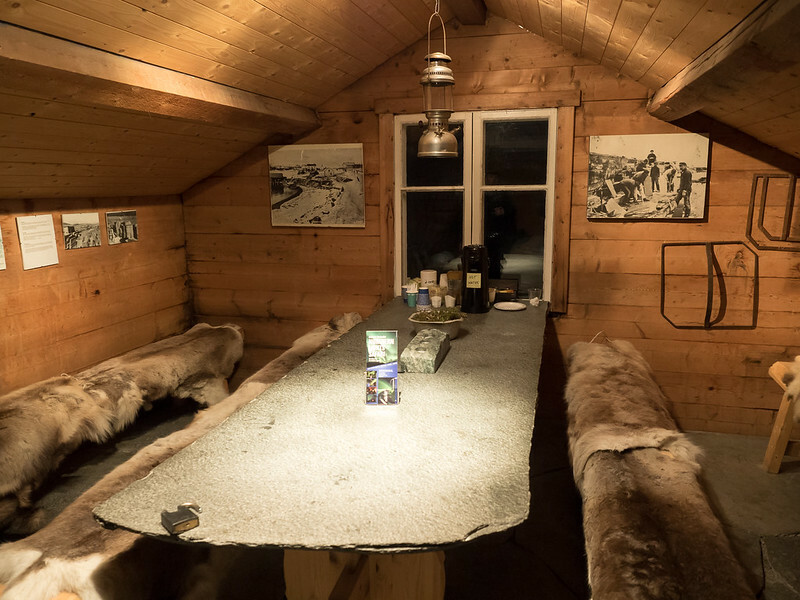 We headed out of the small city and up into the mountains to Pæskatun's main camp, where Trond checked weather forecasts and served us hot drinks in a cozy cabin. Like most Northern Lights operators, Trond will sometimes take guests out into the Norway wild to chase the aurora if the forecast looks better somewhere else. But on this night, strong winds and fast-moving clouds lead him to tell us we should probably just stay put. Marie and I were fine with this, since neither one of us really wanted to get stranded on some far-away mountain pass. 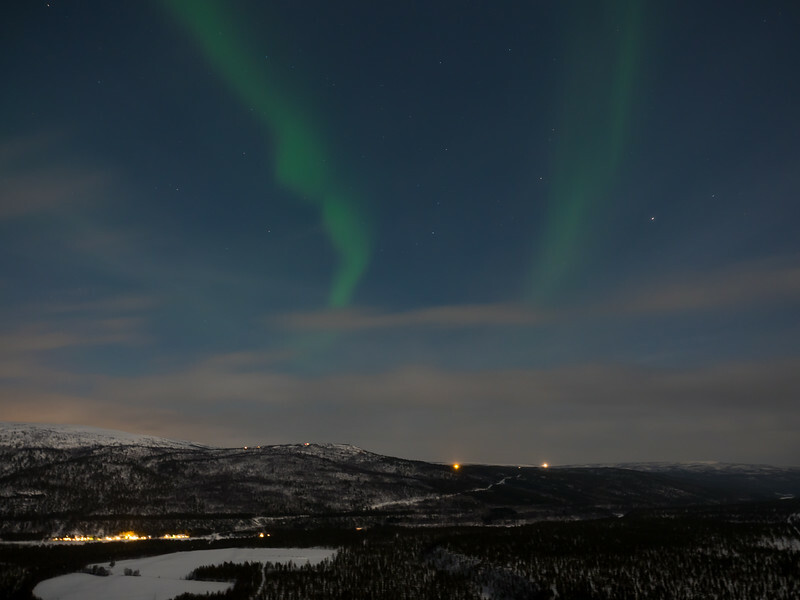 The aurora forecast for the night was low – only a 1 or 2 on a scale of 9 – and Trond spent some time showing us how to read some of the forecast and reporting charts that he pulled up on his laptop. He also helped us set up our cameras, and lit a fire in the traditional Sami lavvo next to the cabin (because if we couldn't see the Lights, at least we could have fun with some night photography). The Lights DID end up making an appearance, though. About an hour after we arrived at base camp, the sky directly above us began to clear. And then, verrrrry faintly, the aurora borealis began to reach out tendrils of barely-green light. The strength of the aurora – which appears when particles blasted into space by the sun collide with elements in Earth's atmosphere – varies based on a lot of factors. It often starts out weak and gets stronger as the night wears on, but other times it's barely visible to the naked eye. Sometimes, it simply doesn't shine at all. On this night, the aurora was weak. 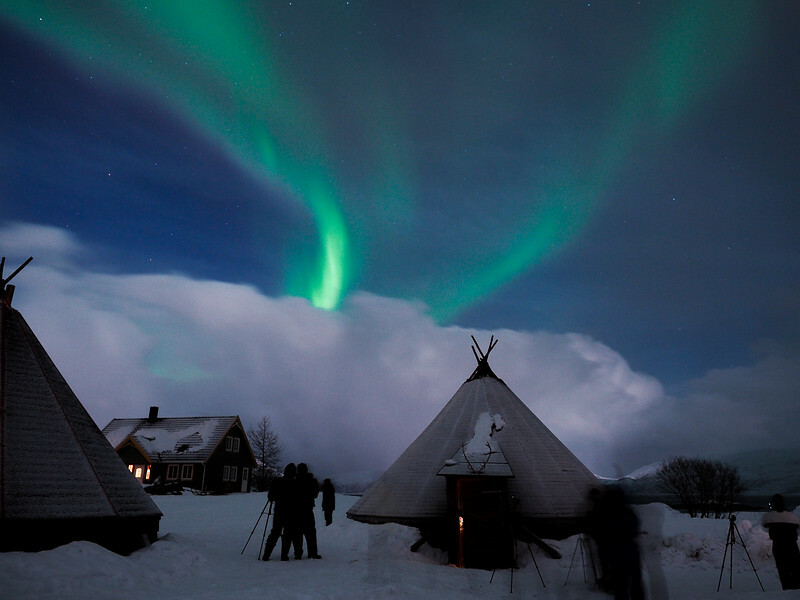 It was tough to tell whether that wisp above your head was just a cloud, or weather it was a band of Northern Lights. Most of the time, the only way to tell was to take a photo, since the colors of the aurora are captured much more clearly in a long-exposure photo. But, considering we hadn't expected to see anything on this trip, those little wisps of green made us really happy. It helped, too, that Trond was so excited on our behalf, bouncing around the camp and exclaiming every time the Lights would show up in one of his own photos. If you're going to book a Northern Lights tour in Alta, this one gets a thumbs-up from me. I already started telling this story at the beginning of this post – the stormy night with a poor forecast that ended up culminating in the best aurora show I've seen yet. Everything started out windy – so windy that I almost didn't go outside at the first sign of the Lights for fear that my tripod would just simply blow over. But I knew I would regret it if I didn't, and so I grabbed my gear, made sure my earmuffs were on securely, and left the calm of the Tromsø Friluftsenter lavvo for the chaos outside. It started out slowly – first just a single band of green stretching across the sky. The moon was close to full, which sometimes is thought to be a bad thing for aurora photos since you generally want the sky to be as dark as possible. But I actually thought the moonlight made the Lights look even more otherworldly. The clouds soon came back in, obstructing moon and aurora alike, so we all went back inside to warm up and roast some marshmallows over the fire. But before long the sky was clearing once more and a shout from outside the lavvo told us that the aurora was nowhere near done with her show. The sky went from completely cloudy to blazing with green light (green light that you could clearly SEE with the naked eye) in a matter of minutes. It was almost like the Lights were parting the clouds. The display took my breath away and literally brought tears to my eyes. And the more the clouds cleared, the faster the Lights began to dance. It was almost as though they knew this was their best chance to put on a real show for us. Can you spot the different shades of green, and the purple?? At one point, there were three or four different curtains of light moving in different directions across the sky, criss-crossing and merging and dancing off again. I would be taking a photo in one direction and gazing, slack-jawed, in another. Amidst my near-crying, I remember yelling “I need more eyes!” because the Lights were moving so fast in so many different directions. The photos, of course, do the actual spectacle little justice. And then, just as quickly as it had begun, the show was over. The aurora disappeared. The clouds rolled back in. And the 14 of us went back inside the lavvo with grins plastered on our faces. 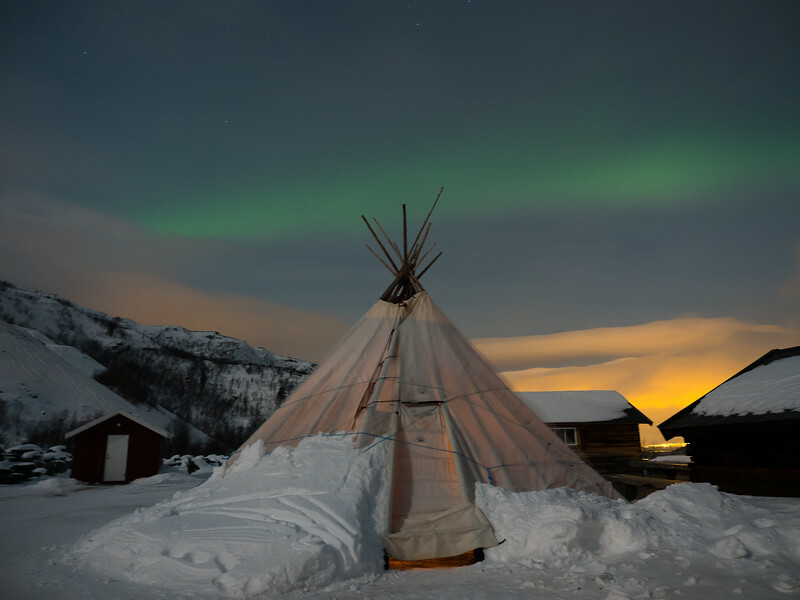 The show at Tromsø Frluftsenter's base camp was so incredible (and so unexpected) that I would have been happy to have that be my last brush with the aurora in Norway. But we had one more Northern Lights tour booked. Again, the weather wasn't great. But our guide – Guide Gunnar from Tromsø – is known for taking small groups of Lights-chasers hours out into the wilderness in order to find clear skies. This guy will take you all the way to Finland if he needs to. 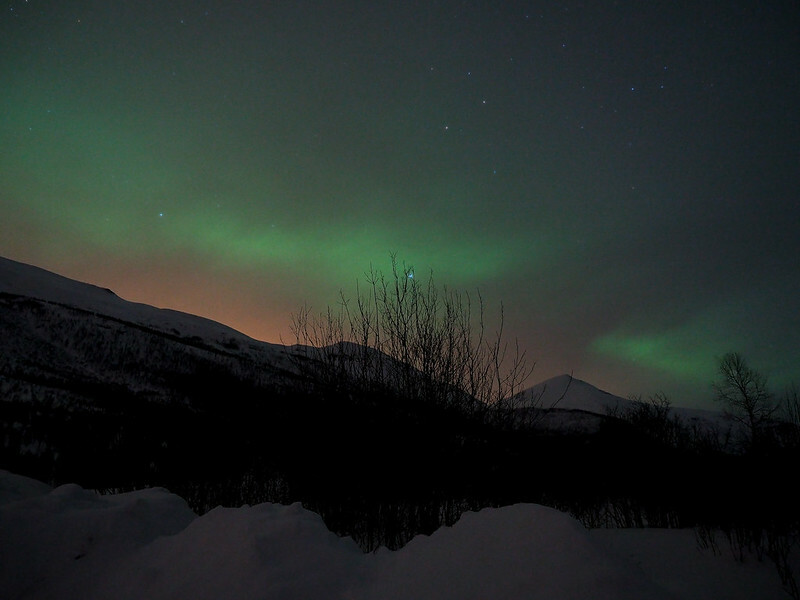 Thankfully, there was a valley with relatively clear skies only an hour away from Tromsø, up in the Lyngen Alps. 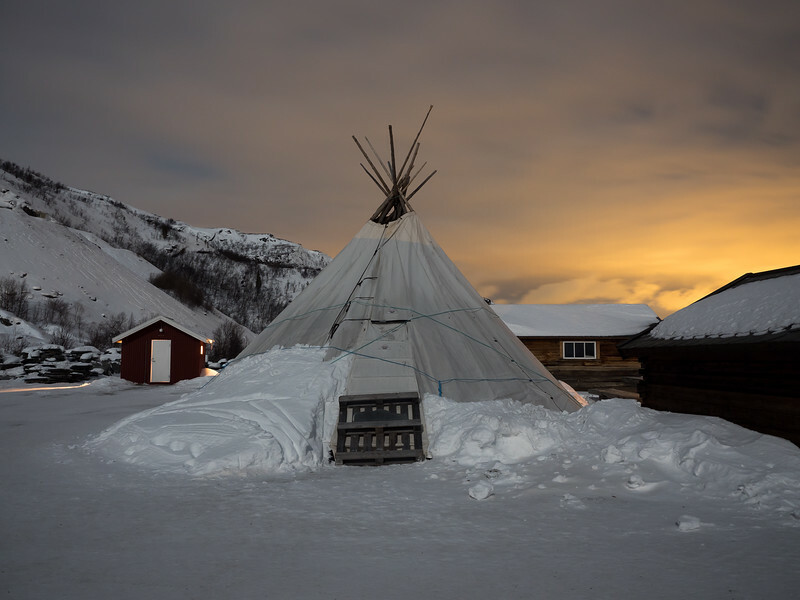 We made one stop when Gunnar spotted the aurora hovering over a nearby mountain, and eventually moved to an even more remote spot where we parked on the side of the road and built a bonfire in the snow. 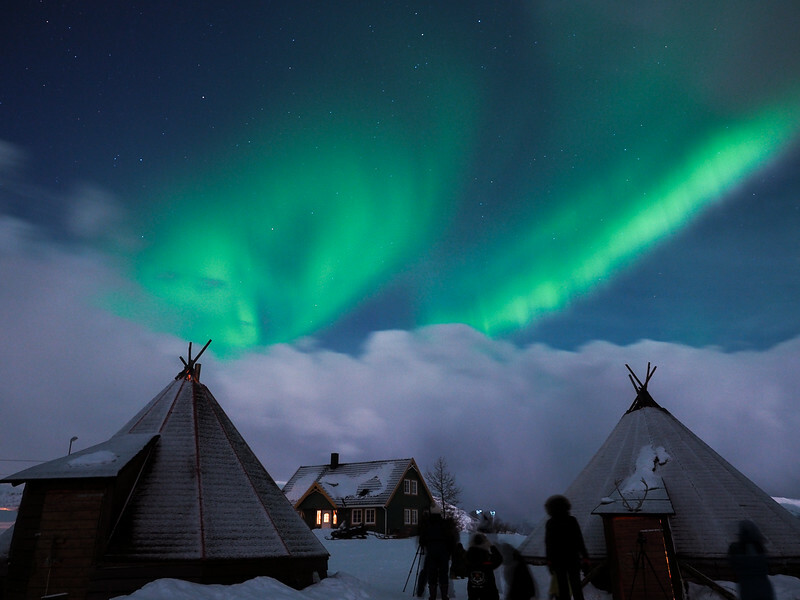 Over cups of hot berry juice and tiny sandwiches of Brunost cheese, our small group swapped travel stories, sidled up to the fire (it was the coldest night by far during my time in Norway), and waited to see if the Northern Lights would grace us with another show. In the end, we DID get one more glimpse of the aurora – one more fleeting hint of green on the horizon before deciding to call it a night just before midnight. Again, it was a reminder than no two aurora-chasing trips are the same. 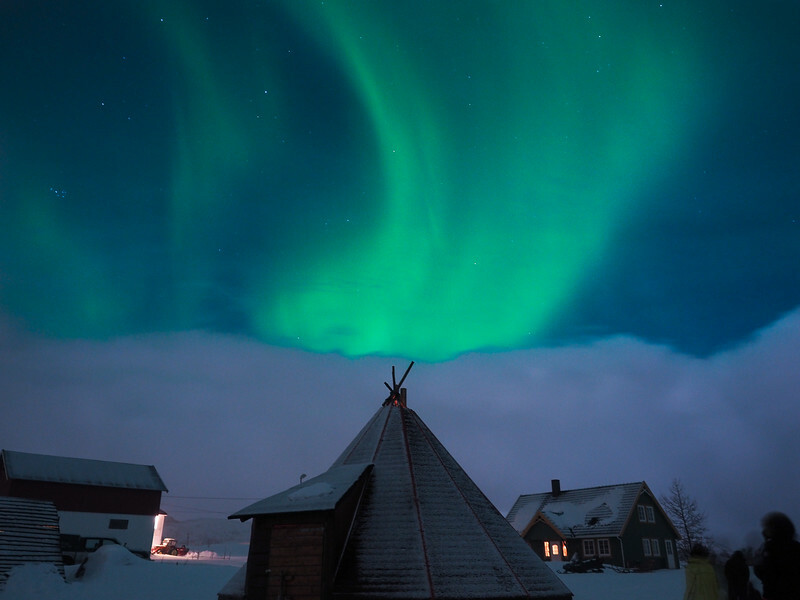 And yet, every glimpse of the Northern Lights feels like pure magic. 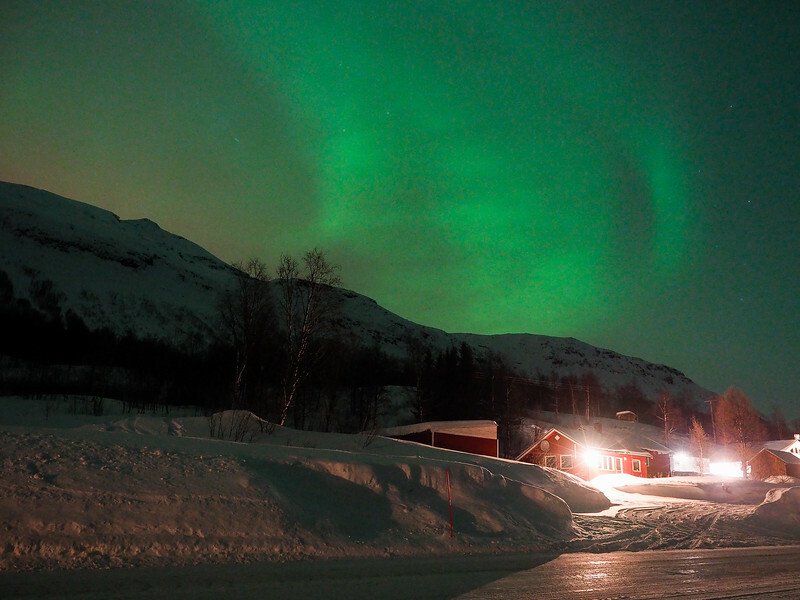 I can highly recommend all three of the Northern Lights tours mentioned in this post. All three are designed for small groups (no charter buses here), and all are focused on actual “chasing” – i.e. driving further away for clearer skies if necessary. They all also include hot drinks and snacks, warm weather gear if you need it, and usually a fire to gather around. 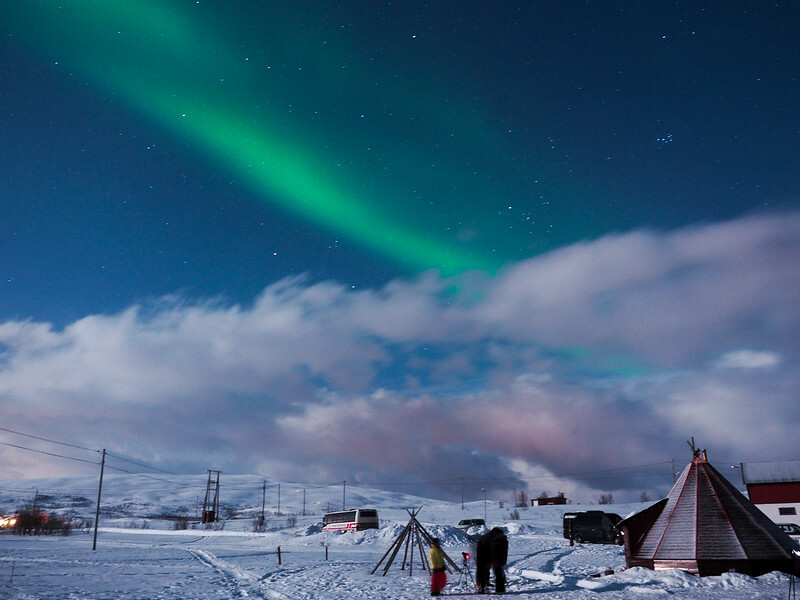 In Alta, check out Pæskatun's Northern Lights Safari. In Tromsø, both GuideGunnar's Aurora Chase and Tromsø Friluftsenter's Northern Lights Chase are great options and worth the price. A camera that allows you to manually control things like shutter speed, ISO, and focus. You don't NEED a fancy DSLR, but you will need a camera that lets you take long exposures. I shot all the images in this post with an Olympus OM-D E-M5 Mark II and a 12-40mm Pro lens. A sturdy tripod. When you're taking long exposures, you need to keep your camera absolutely still in order to get a crisp image. And this is especially important when you're taking exposures of up to 30 seconds, which is what you sometimes need to do with the aurora. The best way to ensure clear photos is to put your camera on a tripod. I have the Vanguard VEO 235AP aluminum tripod, which is a great mid-range model. It's weighty enough to not be blown over in strong winds, yet light enough to carry in my backpack. A remote shutter release. Even pressing the shutter on your camera can produce enough shake to ruin a long exposure shot. I have an Olympus cable remote that works with my camera, though if your camera has built-in wifi, you might also be able to control the shutter from your smartphone. A headlamp. Having a headlamp with you isn’t essential, but it can certainly come in handy when you’re trying to adjust your camera, set up a tripod, or even just make your way through snowdrifts in the dark. If your headlamp has a red light option (or if you can simply put some red tape over it), that’s ideal, as red light does not blind you in the dark. 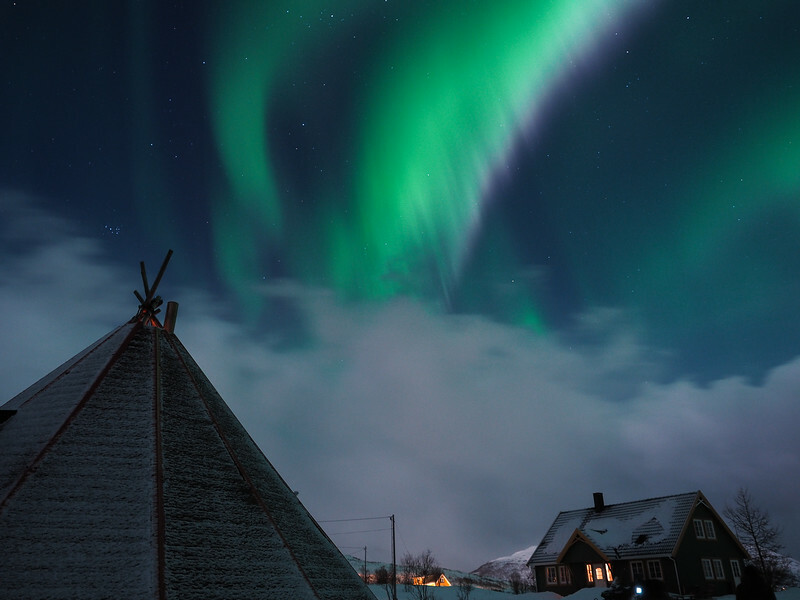 Who is ready to book a trip to Northern Norway to see the Northern Lights? Adding Norway to my never ending travel list. Don’t feel too bad – I’ve never gotten lucky in Iceland, either! 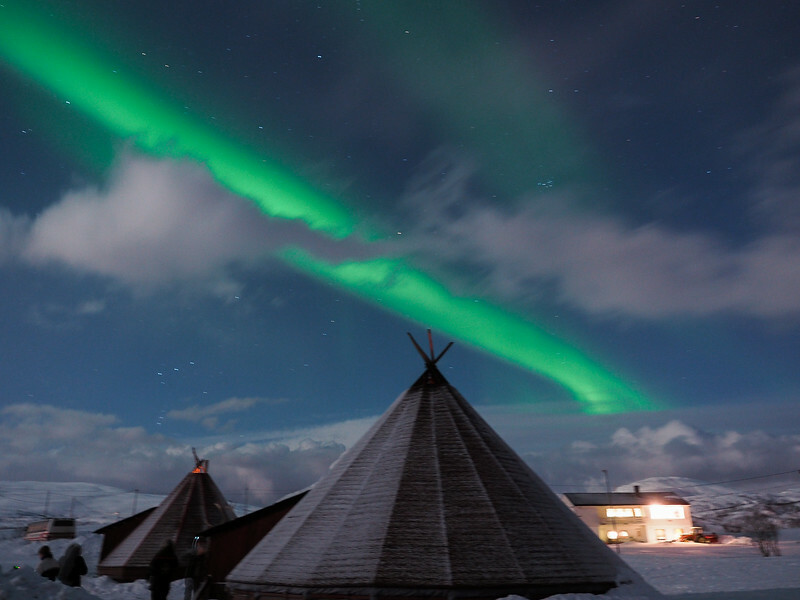 Norway is a great addition to your list for any time of year, though – it’s amazing! And you’re welcome on the camera rec. I’ve been shooting with Olympus mirrorless models for four years and really love them. The one I have now (along with that lens) is AMAZEballs. Hi Amanda, I’m with Rachel. Those photos are stunning!! Looks like you had a blast! Thanks, Kara! And yup, had a great time in Norway! SO stunning. I can’t imagine how it must’ve been to see in person. This is on my bucket list!! It’s very exciting to see them in person – especially if they decide to dance! That really is incredible. It brought tears to my eyes! Beautiful long exposure photos! The tours look worth it! The northern lights are definitely on my bucket list, but I don’t like being cold either! 😉 Did you buy any special winter clothes for the trip? 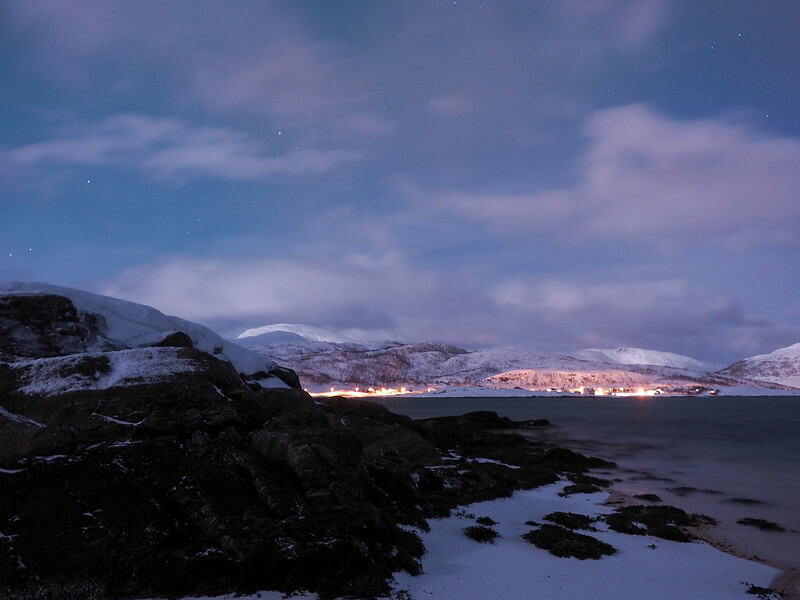 It’s much less cold in Northern Norway than if you were in the Arctic in any other part of the world! But it still gets below freezing at night. I have some good winter gear that I take on trips like this (I’ll be putting up a packing list soon! ), though a lot of the tour companies will supply warm jumpsuits and thermal boots if it’s going to get cold. 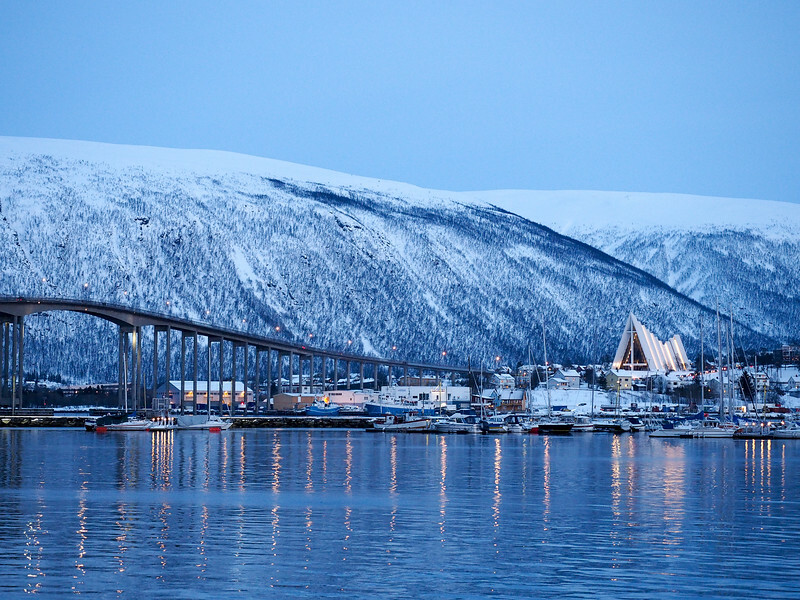 Welcome to Tromsø and Arctic Norway! Thank YOU, Gunnar! And that’s a great suggestion about visiting in the autumn – best of both summer AND winter! It sounds awe inspiring! All those tour operators have been noted for when I make a trip to Norway! Can you usually not see the colors as well with the naked eye? Are they just fainter, or do the colors seem nonexistent sometimes? It totally depends on how strong they are. If the Lights are weaker, they will often just look like slightly green-tinted clouds. But if they’re stronger, then you can definitely see the colors with your naked eye. I don’t think I would ever get tired of seeing them, either! I can’t get over how beautiful these pictures are. I literally can’t stop staring! Wonderful post, thanks so much for sharing. Aww thanks so much, Lauren! I’m so glad we got to see them and that I got a few good photos! OH MY GOD! This is truly magical! Yes it’s definitely a magical phenomenon! I hope you do too, Leonie! It’s certainly a memorable experience. Lucky indeed! Especially with that second show – I’ve never seen anything like it! Your photos are so lovely! Finding a tour operator that will chase the lights sounds much better than just getting on a coach and sitting tight. Even if you don’t see the lights you still have the experience. Norway is definitely on my list. Definitely! Most of the companies have a “camp” that they’ll take you to if the weather looks okay there, which usually includes a nice lavvo and fire – and it really does add to the experience! Great pictures! They make me want to take my own trip to see the Northern Lights RIGHT NOW! Awesome to hear! We’re getting towards the end of Northern Lights “season” (the days will be too long soon), but it starts back up in September! Wow, what an incredible experience! Seeing the Northern Lights is on our Bucket List and now I’m thinking Norway will be our destination. Thanks for sharing! 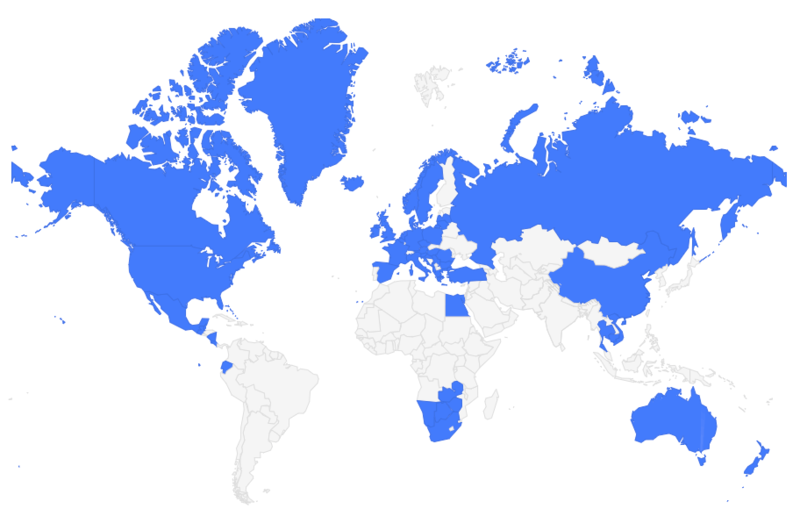 Norway is a great option! It doesn’t get as cold there as in, say, Finland or northern Canada. And Norwegians are just so darn nice – all of the tour guides I had were great! Great blogpost. Thoroughly enjoyed it and reminder me of my daughter’s exploits while visiting Tromso via couch-surfing. Her host was a Sami and shared amazing experiences through her. Sounds like a very cool experience! Tromso is probably one of my favorite places in Norway! Thanks for adding the photography tips! I’m scared I’ll see the Northern Lights one day and I won’t know how to capture them on photo! Your instructions are comprehensive and your photos are gorgeous! No problem, Dominique! Night photography can be tricky, so I’m happy to share everything I know about it! 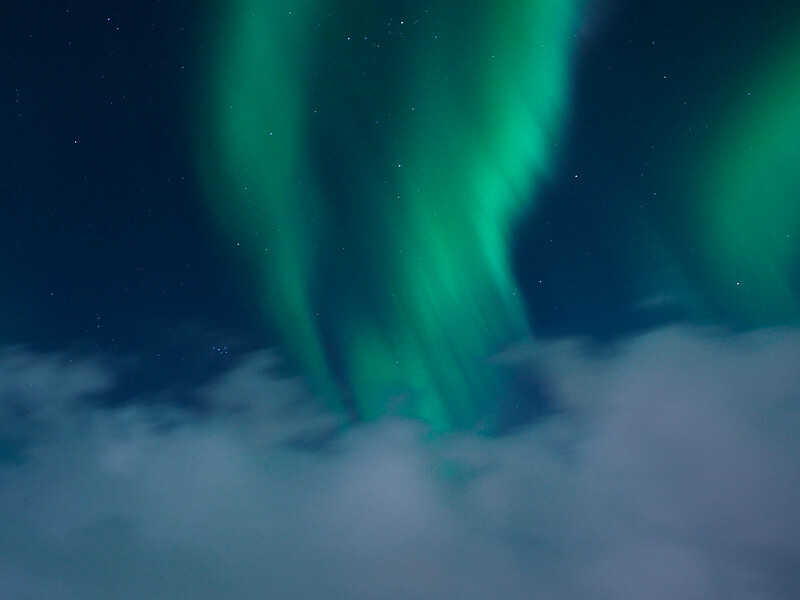 The photos will never fully do the real thing justice – just seeing the Lights dance across the sky is an incredible experience, and something I will never forget! Your photos are fantastic! The aurora borealis is a tricky lady, indeed. When I was in Lofoten Islands, it was snowing all day long and I already scrapped my hope to see Northern Lights, but I went out that night anyway… and for God knows how, it appeared! Tromsø was another story. The weather prediction was fine, the solar activity was there, but when night comes the snow starts to fall… and fall and fall. The Arctic weather is a beast. Yup, the weather can certainly be tricky to predict (and even trickier to deal with when it doesn’t cooperate!). Glad you got to see them in Lofoten, though! Oh yes… the view was spectacular in Lofoten! Those photos look so amazing! It’s unfortunate that the weather wasn’t good during your last Northern Lights tour but the bonfire in the snow sounds fun. Exchanging travel stories seems quite enjoyable. Yeah the bonfire was a fun addition – and a great way to stay warm, too! Quite simply…amazing! 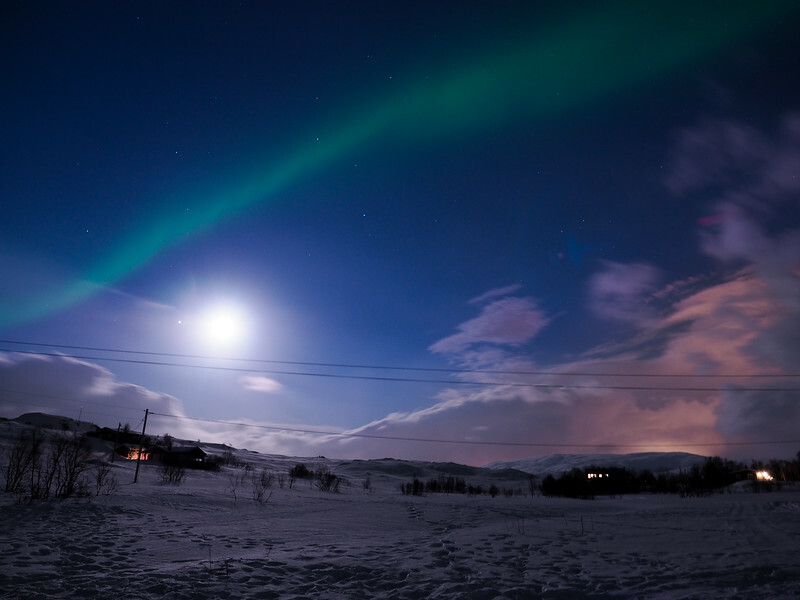 I’ve yet to see the Northern Lights, but determined to track them down one of these days! I highly recommend it! Definitely an experience I’ll never forget or get tired of! I would also add that you will need a lens with infinity focus and an extra battery, just in case! The extra battery is indeed a must! Infinity focus helps, though most lenses DO have it, so long as you can put your camera into manual mode. It’s just tricky to find sometimes if it’s not marked on your lens.